A thrilling journey awaits on Casino Heroes! In fact, this casino not only has great slots, jackpot games and table games. But the casino itself will take you on an adventure across different worlds where you’ll beat bosses and collect extra rewards. Casino Heroes is a company that started in 2014. Ever since the casino went live, they’ve redefined the standards of gaming. Plus, the team is always taking the fun factor to another level! It’s no wondered that over 400,000 players are happy to call this casino home. Casino Heroes is fully licensed and regulated by the UKGC. They’ve also won several prestigious EGR awards. Including Operator of the year in 2016, and Casino operator marketing and innovation of the year in 2015. Casino Heroes is a one of a kind casino that players who seek challenges will adore! This casino understands that everyone’s needs are different. For this reason, they’re offering new depositing players two different Welcome bonuses. So, if you decide to sign up to this casino and make a deposit, you’ll have a dilemma. So, will you claim the 100% up to £50 + 200 Free Spins bonus, or tempt faith at winning big by claiming the 300 Free Spins offer? The choice is entirely yours but keep in mind that you’ll need to deposit a minimum of £100 to claim the second offer. But Casino Heroes generosity doesn’t stop at offering two juicy welcome bonuses. In fact, players who’ll continue their journey through fantasy land will have the chance to claim a second, third and even a fourth deposit bonus. Which means that the total giveaway is equal to £400 in bonus + 200 Free Spins, or 600 Free Spins on pre-selected games. What’s important to know about Casino Heroes and the Bonuses? As seen above, from the moment you’ll start your winning quest you’ll choose the bonus path you’ll take. In fact, if you decide to take the 100% Bonus + 200 Free Spins offer, you’ll receive 20 Free Spins on Starburst for ten days. Plus, any subsequent bonuses you’ll claim will always give you more money to play with but no Free Spins. Alternatively, if you choose to claim the 300 Free Spins offer. You’ll receive them over 2 or 3 days depending on how much you deposit. And of course, any subsequent bonuses you’ll claim will always give you extra Free Spins. But regardless of the offer you claim, it’s worth knowing that the bonus money is subject to 40x wagering requirements. And you’ll have 30 days to complete the terms of the offer. But remember to not bet over £5 a spin! 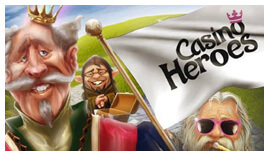 Casino Heroes Pride itself in offering fast and easy withdrawals. In fact, they have many safe payment methods like ecoPayz, Zimpler, Skrill, Trustly, Neteller, Visa and MasterCard to name a few. And if you ever have any problems, you can speak to an agent via Live Chat. The live chat is opened daily from 10:00 – 01:00 GMT. And if you don’t need immediate assistance, you can also send them an email.